Can Tho (VNA) – Chairman of the Can Tho People’s Committee Vo Thanh Thong told Japanese Ambassador to Vietnam Umeda Kunio on August 25 that he wants Can Tho and Japan to foster cooperation in farm produce processing and health care. Thong said that Can Tho city is a major agriculture hub of the Mekong Delta region with high agricultural productivity and quality. However, the prices of many local farm produces have yet to meet expectation, he said, adding that the city is also facing many difficulties in exporting products to certain markets due to poor processing technologies. He suggested that Ambassador Umeda Kunio, through the Japan International Cooperation Agency (JICA), help the city to build a centre for preserving and processing fruit using modern technology meeting international standards. 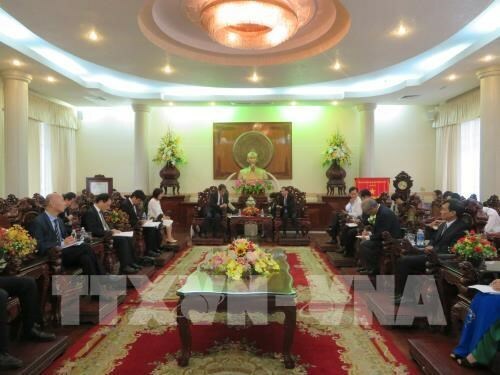 The Can Tho leader also asked the diplomat to assist Can Tho in accessing Japanese ODA to improve its cardiovascular hospital with 200 beds at a cost of about 32 million USD. For his part, Ambassador Umeda Kunio said that he finds Japanese-funded projects in Can Tho are operating effectively with right purposes and expectation. He noted that the proposal on cooperation in agricultural product processing and health care is in line with the two countries’ direction for cooperation, and promised to encourage Japanese firms to invest in Can Tho, as well as introduce Japanese localities to the city for establishing twinning relations.